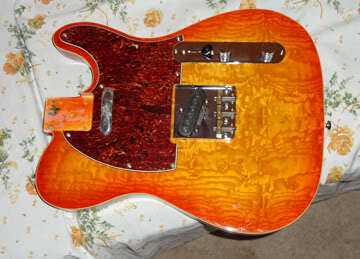 A few years ago, I put together a partscaster Telecaster and took several pictures of the process. I started a thread on the Agile Guitar Forum to share my progress and to get advice. This article will attempt to re-create the story of this project. I’m hoping somebody could benefit from my experience, including my mistakes! 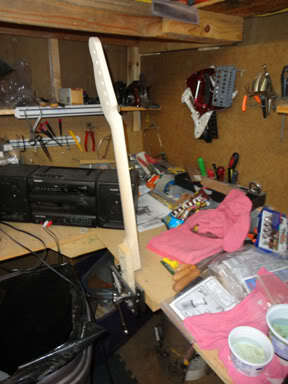 The project was to mate a maple neck with a Douglas Telecaster copy body. I really liked the ash burl top on a particular Douglas model, but I didn’t like the neck – I think only a rosewood fingerboard was available at the time for the ash burl body. I prefer maple fingerboards on Fender-style guitars. So, a kind fellow AGF’er and I worked a deal to buy a guitar so he would get a Douglas neck and I would get the Douglas body. I gambled a bit and got a Guitarfetish.com (GFS) neck for all of $35. It ended up working out nicely. Although initially the guitar would have a single-coil neck pickup, I routed it for a humbucker as well, so I would have that option in the future. I figured as long as I had it apart and was in a working mode, I should go ahead and do it. The picture shows holes drilled with forstner bits in a drill press. These make it easier to rout the pickup cavity because there’s less wood to remove. The less I have to use the router, the better! The pick guard will cover the extra routing when using a single-coil pickup. It’s not the neatest rout in the world, but it’s adequate because it will be covered by the pick guard. Ultimately, I did switch out the single-coil and install a humbucker and had good results with it. Now for some neck work! The GFS neck came with a “paddle” headstock. 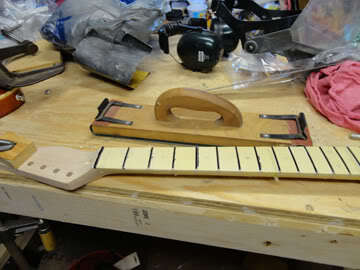 This provides plenty of wood for the builder/modder to shape the headstock as he/she sees fit. I had a Tele neck template available, so I made a drawing of the headstock shape. I traced it onto the headstock and used it as a guide in shaping the headstock. I used a combination of sawing and sanding with an oscillating sander to shape the neck. I was pleased with how it turned out. 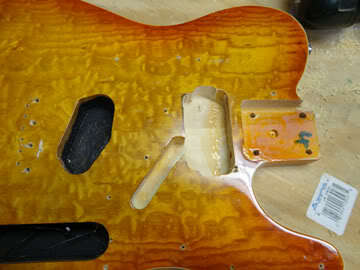 The headstock re-shaping was not the only work the neck needed. Fellow AGF’ers recommended that I do a fret job on the neck as well, thinking that the neck wouldn’t come with level frets. I’m not that good at fret jobs, but I gave it a shot. 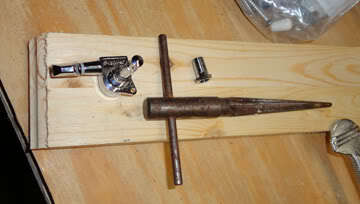 Fortunately, I had most of the tools on hand to do a fret job. 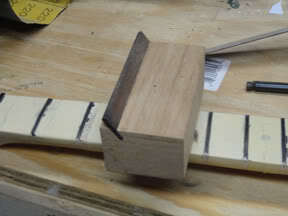 Many years ago, during my first foray into guitar modding/building, I bought the fret leveler shown in the picture above. I was fortunate to buy it, because it is a good tool and I don’t see anything like it on the market now. A piece of glass is attached to the bottom of the leveler. That forms the backing for the sandpaper. I just buy belt sander sand paper and cut it to fit the leveler. 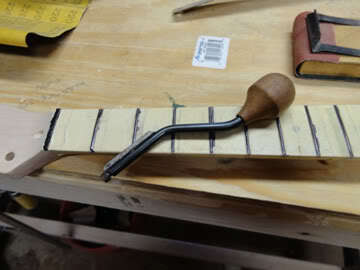 The leveler is used to make all of the frets the same height relative to each other. Frets of different heights can cause a lot of trouble in playing! 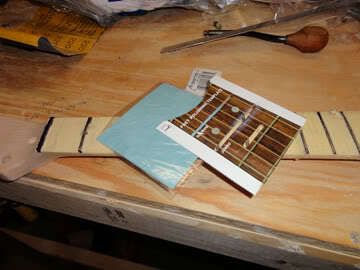 Now, after the frets are leveled, their tops are flat. This is not good. They should be rounded. That’s what the fret rounding tool does. Pictured above is the type that I use, but there are many types on the market that should work fine. The tool shown above is helpful especially when installing frets. The file can be running up and down the edge of the fingerboard and file away those frets that are sticking out. The GFS neck didn’t need much, if any, edge filing. I wanted to convert the bridge to a string-through-body instead of a top loader. This required drilling holes through the body. The end of the strings would be mounted on the back of the guitar, with metal ferrules keeping them from digging out the wood. A friendly construction trades teacher at my high school let me use his drill press. The bit I used didn’t stay perfectly straight, so the holes were a little bit out of whack. They worked OK, though. After drilling through the body with a small bit, I turned over the guitar and drilled holes with a larger bit so the ferrules would fit. I used a bit that was a bit too big, so I have to be careful when I change strings not to lose any ferrules! 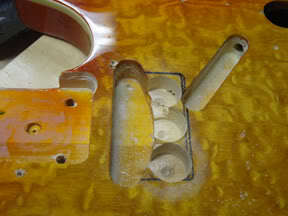 The guitar body came with a nice Wilkinson three barrel bridge with brass saddles. Back to the neck: it needed a finish. After some research, I settled on Minwax wipe-on poly. I ultimately used four coats, allowing about two to four hours of drying time between applications. I liked the look of the finished neck and it feels good when I play it. The neck attaches to the body with screws. The body already had holes for the screws. I needed to drill holes in the neck for the screws to drill into. So, I clamped the neck and body together carefully. I used a cordless drill to go through the body holes and drill holes in the neck so it would be easier to drive in the screws. It’s very important not to drill too far! If you’re not careful, you could drill through the fingerboard. That would ruin your day (and your neck). Some people put masking tape on the bit to indicate the limit; others use metal drill stops on the drill bit to physically stop the bit when it’s about to go too far. Use whatever method floats your boat. Also, be careful on choosing the diameter of the drill bit. It should be just a bit smaller than the screws. It’s better to start too small, because you always can re-drill with a larger bit. 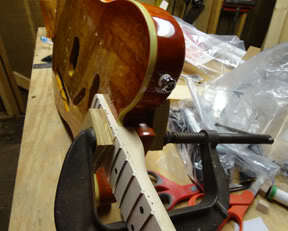 To install the tuners into the holes in the neck, it was necessary to ream the holes a little bit. I happened to have a small reamer that actually was made for metal work. It works fine in this function of slightly widening the tuner holes to accept the tuner. I used Wilkinson Easy-Lok tuners. They make string changes much easier. I gutted the guitar’s electronics and re-built them from scratch. Inexpensive guitars tend to have poor electronic components. I used Alpha quarter-size pots. The switch was replaced with a CRL-type switch, similar to those used on higher-end Fender guitars and like the originals that were on the original Fender guitars. They are inexpensive and easy to find. The capacitor was replaced with an Orange Drop capacitor. 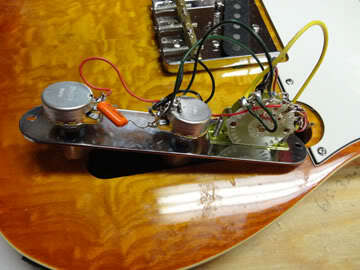 Electronics mods can do a lot to improve the tone of an electric guitar. Here’s the finished Partscaster Tele hanging on the wall. 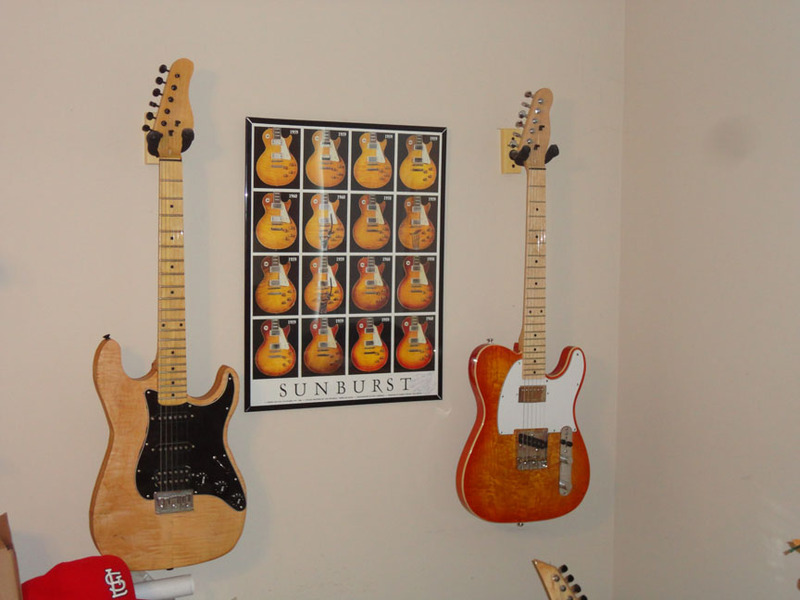 The poster in the middle is of a collection of Sunburst Les Paul Standard guitars. The guitar at the left is a Strat partscaster for which I made the body and used another GFS neck. In this picture, the Partscaster has been conerted to a humbucker in the ned position. Recently, I also installed a micro-tilt neck adjustment. It’s a great guitar and I’m glad to have it!